Connect your audio device via Bluetooth! 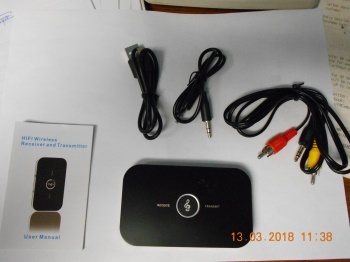 This compact 2-in-1 Bluetooth Transmitter/Receiver allows you to send a Bluetooth Signal from any audio device with an analog 3.5mm or RCA output, or Receive a Bluetooth Signal from any device, and convert it to an analog signal for Playback. You can hook up your MP3 Player to your Stereo with Bluetooth, or listen to your audio with Bluetooth headphones. 1. Dual connect mode: This item is a Bluetooth Transmitter & Receiver in one model. Transform any devices (eg: TV, computer, MP3 player, speaker, headphone.) with 2. 3.5mm jack into a Bluetooth-capable devices. Bluetooth 4.0 technology for enhanced audio quality , improved connection stability and faster pairing. 3. Easy to use, no additional drivers required, mini size, ideal for home, car or other outdoor activities use. 4. Flexible connection: Built-in two 3.5mm jacks for input and output, meanwhile package includes a 3.5mm female to 2 RCA male cable, which provides a wide compatibility to a various of devices. 5. Built-in 600mAh Li-ion battery allows for convenient recharging, long working time is more than 8 hours. 6. Compatible with Android and iOS system and all Bluetooth audio devices such as TV, speaker, PC, CD player, iPhone, iPod, iPad, tablets, MP3 player or car stereo and more.